This is the third post in the series of Wedding Venues. If you have missed the first two posts, you can read it here & here. Its been sometime since I finalized on my wedding venue. I chose a lawn, but for the longest time my eyes were set on a terrace venue. I almost knew that I was going to go ahead with the terrace itself but eventually I got better rates and after much evaluation I opted for the lawn. But that doesn’t mean that terrace is not a good option. Nowadays, everybody wants to do something different for their weddings. Banquets and Lawns are so done to death that you, your guests everyone is just bored attending an event there. It kind of takes away from any kind of wow-ness possible. It just becomes like any other wedding. If you wish to go for a ‘hatke‘ venue, then this post is just the one for you. 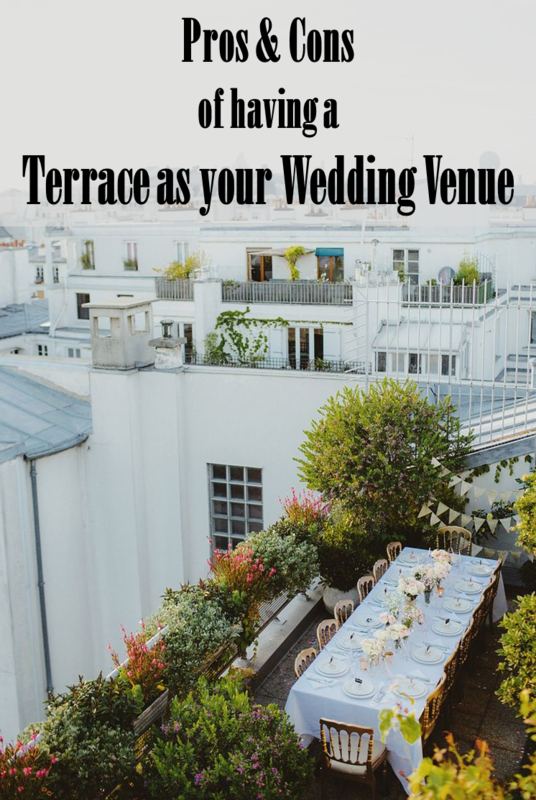 First, lets look at some of the positives of opting for a terrace as your wedding venue. You feel like you are on top of the world, even if the terrace is on the first floor ! Compared to a banquet which may feel claustrophobic to some, a terrace automatically gives a grandiose feeling, what with the open air, and the emptiness around. The minute you are on a higher level, the place will feel more open. If you compare this to a lawn as well, which might be covered with nature from all sides, that sometimes still feels enclosed. But this you wouldn’t see in a terrace venue, which might have some landscaping done at the maximum giving you the open space that’s much needed for any wedding. If your terrace venue is on the higher floors, then it also gives you the advantage to make noise at the party without disturbing too many people. It works better here than making that same level of noise at a lawn event. You don’t require much to decorate a terrace. It all depends on the location of your wedding venue. If the outdoors is picturesque, it will automatically add on to the decor part. But if not and if you have a night wedding, then play with lights…and flowers…and you will be set. The idea is to not overdo anything. When it comes to terrace decor, remember less is more. This is one fundamental issue I had with outdoor venues especially lawns. Decorators tend to rob you with additional generator set costs. And mind you, they do add up significantly to your budget. Take my instance – one generator set rents out for 6 hours for 15k. Depending upon the size of your venue, and the number of hours of your event, you might require anything between 3-5 generator sets. The cost is always a variable. In case of terrace, the building itself would be providing you with the electricity which is always preferable and a safer option. Now you don’t have to fear any electricity failures or any other tantrums thrown by the decorator the last minute. In most cases, the venue will give you a packaged deal. This packaged deal would be your per plate cost, which will include the venue cost + any electricity costs. Its always better to opt for these. Since a terrace has to be within a facility, it will definitely come with its valet parking. This is a huge-huge advantage specially if you are having your event in a metropolitan city like Mumbai, where parking is a big problem. In many weddings that I have attended over the years, this is what I hate the most. You are completely decked up but you get a parking like a kilometer away somewhere and then have to walk the entire way in your killer heels. Its the worst thing to happen. That + the humidity and its the recipe for the perfect disastrous entry to a wedding. You automatically tend to curse the hosts. Make sure you find out how many parking slots are available in the terrace venue that you are shortlisting. Sometimes they allocate only a few for the guests and the rest for the building residents or so. So, just be careful about finding that out. No matter how small a terrace is, it will feel bigger than what it is because it is under the clear sky. On a higher level, the cool breeze is guaranteed which is a big plus point for winter days. If you are choosing a terrace for a summer wedding (which ideally I think you shouldn’t), you can opt for a nice shaamiana set up. Or if you wish to get creative, then you can also opt for shaamiana’s + those big big umbrellas to put over round tables. A terrace is an enclosed area which is easier to cover up as compared to a lawn. In case your wedding is in the winters, then terrace is going to be a blessing. Guests are going to enjoy your function for sure as they will be comfortable as well. The good part about terrace is you can get away with anything. Its upto you whether you wish to do any decor or leave it at bare minimum. From flowers, to floor lanterns which can be kept to decorate on the railings, you can think of multiple things to do at a terrace wedding venue. You could also hang some strings in any directions across the terrace and hang those big round paper lanterns which are both inexpensive yet look amazing and just lift the look of any place. If you are thinking of something a little different for your wedding venue, without having to go all out, then this is the ideal venue type. I would rate this wedding venue to be the perfect balance between conventional and unusual. If your wedding is during the monsoons, or around the monsoon season sometime, then you probably will need to stick to a Banquet for being on the safer side. While covering the terrace is an option, there is no guarantee that it will be completely sealed off giving you the perfect dry experience. In case of summers as well, the problem will be that you are on a higher level, and day time event might get you feeling nauseous. You need to take into consideration that you as a bride will be all decked up + your guests as well, you don’t want them to be sweating it out at your event. No matter how many elevators may be there at the event, peak hours might get a little messed up what with everyone wanting to reach your venue together. Guests might have to wait for awhile for their turn to come. In case your venue is on the first floor, and if the guests are allowed to just use the stairs, that also becomes kind of inconvenient, after all who would wish to walk when they are dressed up in all their finery. Also, troubling for the older guests. This was the biggest problem I had with the terrace venue. Just imagine, the entire baaraat comes dancing and at the venue ground floor, they have to break it off because not everybody can go upstairs at one go. It just breaks the flow and mood, and that’s one disaster that’s hard to recover. Also, with the entire baaraat coming together, it will easily take them more than a couple of minutes to reach upstairs. They will have to break out in smaller groups and use the elevator to come upstairs. Ditto for your groom ! Plus, any guests who would just want to slip away from the baaraati’s and enjoy your wedding function, would now have to wait for the crowd to clear. Its just a very messed up situation to be in. Groom can’t make a grand entry with his entire baaraat ! This is just the continuation with the above point. Even if you send all the baaraatis upstairs first and then allow the groom to go in last so he can make a grand entry, it still is a lot of time waste in the process, and the whole mood might just go away. This is something that you will not be able to get back. High chance, your groom will miss out on a grand entry. I feel a terrace is still a brilliant option no matter what hiccups. If you can find a way around the baaraat entrance it still makes for an ideal wedding venue type. If you are getting a good deal, go for it ! Anyone thinking of going ahead with a Terrace Wedding Venue?